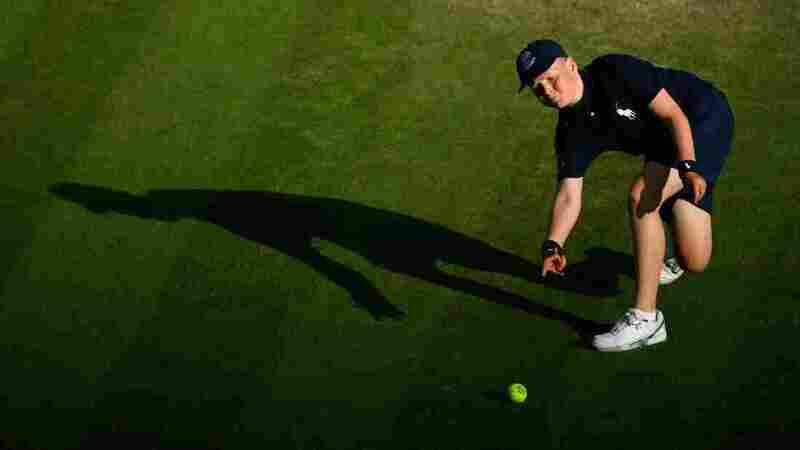 Silent And Unsung, Ball Boys Keep Wimbledon Rolling To make the cut, the tournament's ball boys and girls undergo months of rigorous training. They must remain stock-still during play, roll a perfect roll and bounce a perfect bounce. They must also have impeccable manners and complete command of the rules of the game. If you watch the action at Wimbledon this weekend, you'll see the camera closely tracking Serena Williams and David Ferrer. But you'll also notice smaller, less celebrated figures darting on and off the court. Their training may not be as rigorous as the tennis pros', but it's plenty demanding. Fair and accurate calls from the chair umpire are critical to the smooth running of Wimbledon. So, too, are the six young girls and boys flying around each court. Every roll has to be flat to the floor. Every feed's got to be perfect. Even the way you grip the ball has to be perfectly done. They're all regional high school students, like 14-year-old Chris Howden. "This is a sport in itself," Chris says. "People don't realize that, but it is really difficult." Chris is a first-year ball boy. Before qualifying for the championships, he trained for seven months, several times a week, on the indoor and outdoor courts of the All England Club, where the tournament is held. The ball boys and ball girls warm up by rolling tennis balls to each other — a maneuver they execute over and over during a match. "Every roll has to be flat to the floor," says ball boy veteran Steve Hayes. "Every feed's got to be perfect. Even the way you grip the ball has to be perfectly done, if they're center courts." Hayes served as a ball boy in two Wimbledon tournaments. A highlight, he says, was Pete Sampras' stellar performance in 1999. "I was in every single one of his matches. It was one of the greatest experiences to work at Wimbledon," Hayes says. "I still have my uniform framed, and all [my] photos." Hayes now coaches the next generation of ball boys and girls, making sure they master the highly precise, waist-high bounce with which they deliver the ball to the player who's serving. Hayes' trainees must follow a fitness routine complete with knees-to-chest jumps, squat thrusts and sprints. After all, it requires a fit body to achieve that perfectly choreographed grab of an errant ball, or the roll to a colleague at the server's end of the court. A ball boy or girl just can't afford to get winded, particularly if you're working on the side of a player who's making a lot of mistakes, says ball boy Chris Howden. "If they keep hitting the net, you have to keep sprinting and collecting the ball," Howden says. "And by the end of it, you're just praying they hit it over the net and [that] you won't have to run." And while ball boys and girls need to be ready to run, they must remain absolutely still during play— either in a ramrod straight stance, with hands behind the back, or — for those assigned to the net — kneeling down, just off the playing surface and out of the players' direct line of sight. The demands of the job aren't all physical. Ball boys and girls must have impeccable manners and an absolute command of the rules of the game. Georgia Heasman, 15, is one of the select few who have made it to Centre Court — the court where the top names play. She says ball boys and girls always have to keep their cool, even if the players lose theirs. "You have to be very professional about it. Your job is to feed them balls to keep them happy," Georgia says. "That's just it really," she adds. "You just got to keep them happy."